I ended up having dinner with Varen on Friday night. He was supposed to go to the farm with his dad, but it got canceled last minute. He was coming round to finally drop off my hard drive that essentially got us back together a week before - I'd sent it back with him to be filled up with all sorts of tv show goodies :) I introduced him to the wonder of Il Capo's pizza. Saturday involved JofH & I visiting ex-DJMike to further fill our hard drives :) It was a good weekend TV Series-wise. Not that I got to watch much, but now I have a collection to keep me going for quite a while! And then I went boy-shopping with Varen in the afternoon. He needed to buy some clothes and I tagged along and got to pick out most of it ;) And then we went back to hang out and watch some House - one of the few series he didn't finish in our 3 week break ... yes, it's a sore point! Sunday I went home to make a start on all the Series I have to get watched and managed 2 episodes of Lost 3 while Varen went off for Father's Day lunch with his family. 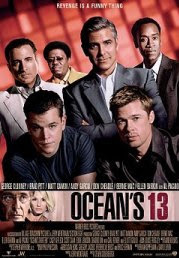 In the evening we went to see Oceans 13. Danny Ocean (George Clooney) and the gang would have only one reason to pull off their most ambitious and risky casino heist-to defend one of their own. When ruthless casino owner Willy Bank (Al Pacino) double-crosses one of the original Ocean's eleven, Reuben Tishkoff (Elliott Gould), Danny and the gang team up one more time to see if they can break "the Bank." Sorry to disappoint, but this time I'm hoping there'll be no drama to go with it ;) fingers-crossed!